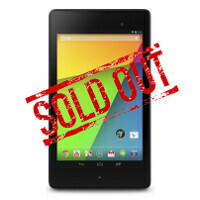 Even though the new Google Nexus 7 wasn't expected to be released until July 30th, a variety of retailers started selling the refreshed slates on Friday and buyers were obviously prepared. At Staples, which offered a $30 discount with a coupon code, both the 16GB and 32GB models are now out of stock. At Amazon, not only is the 32GB variant sold out, orders placed for the tablet now with the online retailer won't ship for 3 to 4 weeks. If you desperately need the new Nexus 7, you could check out some other retail outlets like Best Buy, Walmart and of course, the Google Play Store. The latter started accepting orders for the two refreshed versions of the Google Nexus 7 with Google saying that orders will ship no later than July 30th. Seeing Staples offer the new Nexus 7 before the July 30th launch date is not a surprise. Last year, a Kissimmee Staples started selling the 32GB version of the OG Google Nexus 7 more than a week before it was supposed to be on sale. Glad to see there isn't a huge watermark covering the whole picture this time. Fail of the year. Look how much you save! Amazon is the king of all trolls lol. Lol I just saw that, too. Well Google did increase their sales target for the device like 2-3x more than for last year's model, so I'm sure they asked Asus to step up production accordingly. Perhaps Amazon is just playing safe-estimate here. The Nexus 7 is out of stock at certain BestBuy locations that were selling them ahead of the July 30th 'official' release date. I stopped by the San Carlos, CA BestBuy and they are on back order - they blew through their supply before the morning was out.... I just hope this isn't a repeat of the Nexus 4 fiasco. The Nexus 7.0 pisses on the ipad mini. EVERY ASPECT OF THE NEXUS IS 4X better THAN THE IPAD MINI, YET THE IPAD MINI IS MORE EXPENSIVE. SORRY BUT U HAVE TO BE AN IDIOT TO BUY THE IPAD MINI AT THIS POINT! There's one thing the iPad does better than the Nexus 7, and that's run iOS. I recently bought a tablet and it was a toss up between the previous Nexus 7 and the iPad Mini. The iPad won out because it runs iOS. Good for you loser. Now you own a crappy tablet with poor specs that are 2-3 years back of what is considered first rate. You have less selection in your app store, and you paid almost double what it should cost and got a inferior product. You are now officially another ifool.....baaaa.....baaaa. BUZZ! Wrong answer! I have an iPad and Note 10.1, and the iPad has much better quality apps, and gets them faster. Now besides that, the Note 10.1 is superior. I got mine!!! It's so much better than the first one!! My local best buy said they only sold 2 so far. But people near me are morons so that's why. http://www.phonearena.com/news/New-Nexus-7-to-be-a-flop-for-Google-because-of-Android-says-analyst-Moto-X-to-score-a-home-run_id45706 Ahhhh, analysts... can't live with'em, can't shove their heads up their own backsides. Even though that tends to be where they speak from most.